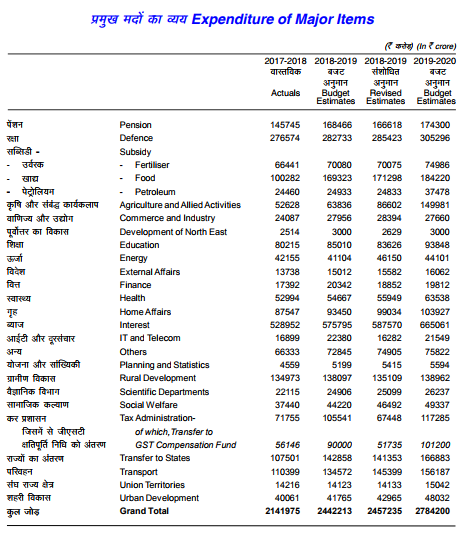 New Delhi: An analysis of the government’s budget allocation on major items shows that India continues to spend approximately five times more on defence than on health care. Defence accounts for 11% of India’s overall expenditures and health accounts for 2%. India’s defence allocation this year (2019-2020) is Rs 2,82,733 crore and health allocation is Rs 63,538. The defence budget is 4.8 times the health budget. In the last budget (2018-2019), the defence allocation was Rs 2,82,733 crore and health allocation was Rs 54,667 crore, which is 5.17 times the health budget. And in the budget for 2017-2018, the defence allocation was Rs 2,62,390 and health allocation was Rs 48,878, which is 5.3 times the health budget. Out of the 27 major items of expenditure, health gets the 14th largest funding this year at Rs 63,538 crore. In fact, the largest budget allocation every year, is consistently the amount of interest India pays on borrowings. And consistently in second place is the defence budget. Interest on borrowings is a heavy Rs 6,65,061 crore and the defence allocation is about half of that at Rs 3,05,296 crore. The other areas that get six-digit funding like defence and interest on borrowings are: pensions, food subsidies, agriculture, home affairs, rural development, tax administration, transfers to states and transport. India’s health budget has gone from Rs 55,959 crore (revised estimate, 2018-2019) to Rs 63,538 crore (budget estimate, 2019-2020). That is an increase of 13.54%. While this increase, when seen as an isolated percentage may seem impressive, the figures can be concerning when seen in relation to India’s budget on other areas such as defence, and the fact that health gets only the 14th place in terms of budgetary priorities. Health spending is also a concern when the health budget is analysed for its internal components. Core health areas like the National Health Mission (NHM) have seen drops in their funding, over the last few budgets, including this one. This comes even as a big flush of money has been pumped into the Ayushman Bharat health insurance scheme, where the budget has gone from Rs 2,000 crore to Rs 6,400 crore. The NHM has been allocated Rs 31,744 crore this year, which is nearly half of the entire health budget of Rs 63,538 crore. This allocation to NHM of Rs 31,744 crore is an increase from last year’s allocation of Rs 30126 crore. But the National Health Mission has seen its budget drop every year, since at least 2017-2018. In fact, this budget’s allocation for NHM is very close to the actual spending for NHM in 2017-2018, which was Rs 31,510 crore. According to an analysis by the Accountability Initiative for the financial year 2017-2018 and 2018-2019, allocations for NHM declined by 2 %. NHM’s share as a total of the health ministry’s allocations went down from 58% to 55%. And a further analysis of the various components of the overall health budget and the NHM budget show that this drop is primarily coming from the government pulling out funds from the vital components of maternal, reproductive and child health and from communicable diseases. In these previous two budgets, funding for reproductive and child health fell by 30% and funding for communicable diseases fell by 27%. The share for reproductive and child health funding, as a share of the overall NHM budget, has fallen significantly, from 40% in the financial year 2016-2017, to just 15% in 2018-2019. This is despite acting finance minister Piyush Goyal, saying towards the end of his budget speech, that a healthy India will be “built with the participation of women.” He also said that India must not have just women’s development, but must have “women-led development,” while talking about the health of women.